The Star Trac 4500HR treadmill is a top model from the world’s leading commercial treadmill manufacturer. While a new elite treadmill might be out of your price range, buying a remanufactured model will provide just as many years of health club quality workouts. The Intelli Trac display matrix gives precise readouts of time, distance, speed, incline, calories (total and per hour), laps, pace and heart rate. UPDATE: The 4500 HR is no longer available. Check out the most popular models on sale here. The Star Trac 4500 HR treadmill is equipped with a custom aluminum uniframe, a cool-running and durable 2.5 HP continuous duty direct-current (DC) motor, neoprene deck cushioning and soft system levelers for shock absorption, and 3" crowned rollers with sealed bearings. All Star Trac 4500 models have a “soft start at zero” feature so the treadmill starts at 0 mph and gradually increases to 0.5 mph. The 1" thick reversible deck is made of treated composite fiberboard. Decks of this quality can typically last over 3,000 hours per side, extending the use to twice that of other systems. The Soft Track tri-cell Suspension System features the patented Impact Absorption System (IAS) cushions to relieve stress on the ankles, knees, hips, and back. 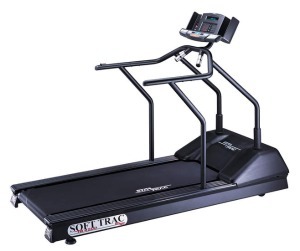 The Star Trac 4500 HR treadmill has a Sport Utility Display that features a convenient water bottle holder, integrated reading rack, and towel holder. The user can select from hundreds of pre-programmed training options including fitness tests and dynamic heart rate control programs. The Personal Trainer Studio™ mode enables personal trainers to customize training programs for their clients. The only glaring weakness is in Star Trac’s oddly short warranty of 3 years. You’ll get 10 years of parts and a lifetime drive motor coverage when you buy a Life Fitness, Precor, Landice, or Bodyguard treadmill. 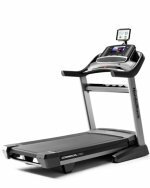 New, the Star Trac 4500HR sells for $6,295, but a refurbished model ranges in price online from $1900 to $2600 and will look, feel, and perform as a near new treadmill. These reconditioned models have rebuilt drive motors, new belts, new electronics, and everything is tested and calibrated. As leading treadmill reviews indicate, Star Trac is the number one seller of commercial treadmills, and pros will tell you that any of the 4500 series models are a good buy for use in any fitness facility. If you can find a remanufactured model for less than half the price of new, the Star Trac 4500HR treadmill is a good investment for a home user.